The Prolix Patriot and the Missus took advantage of the beautiful weather yesterday in the wake of Hurricane Irene to visit the new Martin Luther King, Jr. National Memorial. We knew that there was some controversy surrounding the project, but we were completely unprepared for how truly underwhelming the final product really is. Sadly, the memorial fails to capture the awesome scope of what this Baptist preacher from Atlanta accomplished in his tragically short life. Nowhere in the memorial is there any inscription of King’s most famous and uplifting words from the “I Have a Dream” speech. The “mountain of despair” quote is drawn from the speech, but completely misses the transcendent nature of what Dr. King was trying to accomplish. 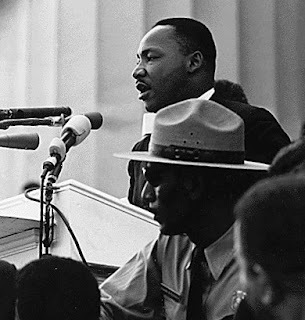 Indeed, in that speech, King himself implored his listeners not to “wallow in the valley of despair.” By memorializing despair, the memorial runs counter to everything that King stood for. Worse still, although Dr. King was a Baptist minister, there is no mention of God anywhere in the memorial at all. In the Jefferson Memorial, we have the core ideals of America encapsulated in the preamble to the Declaration of Independence. In the Lincoln Memorial, we have the brilliant and haunting eulogy of the Gettysburg Address. Both refer to God as the source of liberty. Why doesn’t the Martin Luther King, Jr. Memorial include the recurring motif of “all God’s children” that epitomizes King’s achievement as the consummation of Jefferson’s and Lincoln’s ideals? Instead of celebrating the triumph of the thoroughly Christian values of love, compassion, and charity over hatred and violence, the memorial has an unpleasant similarity to the eerily smiling pharaohs of Abu Simbel. Instead of celebrating the great advances in racial equality, the memorial is a puzzle with half the pieces missing, but Rev. Dr. Martin Luther King, Jr. was not a cryptic figure or an obscure mystic. He spoke plainly and honestly about the need for racial equality. It’s a shame the monument does not live up to that legacy.